"Your bike belongs in a museum, not on the road," was how one doubter tried to discourage Gordon May from undertaking this journey. Despite intense heat in excess of 40C, a crash in the Baluchistan desert and some of the worst roads and driving standards on the planet, Gordon's old Bullet did indeed make it triumphantly to Chennai. In Overland To India, Gordon describes in detail the restoration of his motorcycle and the build up to departure, the larger-than-life characters he met and the many challenges he faced. He also recounts the more personal highs and lows life on the road. Above all, Overland To India is a heartwarming story that illustrates human kindness and hospitality and encourages other riders to take their own motorcycles on a long-distance journey. 256 pages including 40 b&w photos and 8 pages of colour photographs. 2015 Update. New SECOND EDITION features additional chapters: Most frequently asked questions; 'How To Guide' for those wishing to ride to or from India today; Spare parts list; Route planning guide. The second edition also features an additional 40 photographs. 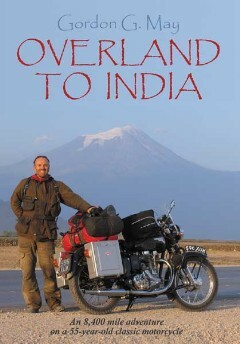 To purchase Overland To India, click the button below. Your order will be processed by Royal Enfield Books using an SSL secure server to collect your details (once you click 'Go To Payments') and Paypal to process payment. NB You do not need a Paypal account to process payment... you can use any credit or debit / bank card. Books can also be posted worldwide.